My Body, My Baby, My Birth? Al-Jazeera- I love their work. Recently Al-Jazeera has been exploring the political battles over where a woman can birth in a series called BirthRights. Definitely take the time to watch it on YouTube. You remember the phrase from the 1970's civil rights movements? My Body, My Baby, My Birth (or for those advocating for abortion rights, My Choice). What do you think? Who has ultimate autonomy over a woman's body? Should women have the right to give birth with who and wherever she chooses? Do the regulatory laws that we set up to license professionals and protect women from unqualified practitioners also serve to limit their choices? Do health practitioners truly have the health of women as their top priority, or are they just as territorial as your next businessman? Are you willing to abdicate responsibility for your health to someone else to make decisions for you about what is safe and what isn't? There is not a place in the world where this issue is at rest- although there are places where there are more options available than others. I had my first baby at a hospital. I took Bradly Method classes to prepare, but even so I wasn't satisfied- I felt stripped of dignity and defeated by the experience. I never wanted to go through that again, so I studied and read more about childbirth. I had my second baby at a birth center- which was better, but it still just felt like a low-tech hospital with a tub that I could labor in. I loved the water birth experience! But even the nurse midwives kept looking at their watches, giving my deadlines to meet, talking about what interventions I should consider. I wanted to birth someplace where I was acknowledged as the ultimate authority on my body- where my inner wisdom and personal wishes were respected, and the people around me trusted the beautiful and powerful process of birth. My next two children were born at home with a rented birthing tub and two highly trained midwives. They were wonderful and amazing births! That is what birth should be like- a safe environment, surrounded by people you love- who are confident in your ability and power to birth.We had some false alarms (I was even dilated to 5cm)-but the midwives just went home and we waited until labor started again the next night. I remember in the most intense moments of labor, sinking into the water with deep vocalization and letting my body completely relax while the arms of my sisters and husband held me up and supported me. Safety, privacy, and patience. These are really what birth requires- and they are the three things that it is difficult to find in a hospital. 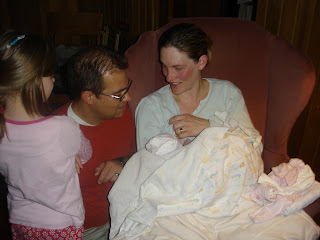 Moments after Mehrsa was born, I was able to initiate breastfeeding and introduce her to her big sisters. The more women learn about a different model of birth- a model other than medical interventionism that dominates most places in the world, including Kuwait- the more they are seeking for a return to the midwifery model. Midwifery is woman centered- a model that trusts women's bodies and their ability to birth; a model that recognizes that the intense journey of labor and birth is a rite of passage that transforms a woman into a mother and supports and encourages her through that process rather than trying to "rescue" her from it. The medical establishment- because they are trained to treat you when things go wrong- inherently feeds into cycles of fear and mistrust of the process. This is an ongoing battle that women and men will continue to fight, a battle for information, autonomy, and the right to act on that information- it is political, economical, and deeply, deeply personal. Hi Sarah, I had a similar experience to your hospital experience for my first child. I opted for a home birth the second time around, without hesitation. It was the best decision I ever made. If and when we ever made it to Kuwait, I would love to help out with your new NGO!